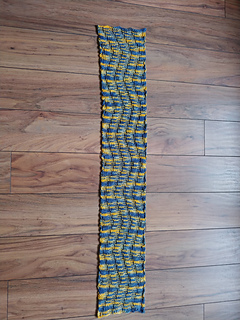 I named this scarf “Undulate” because that’s what it does, the pattern gently going back and forth yielding a subtle serpentine. 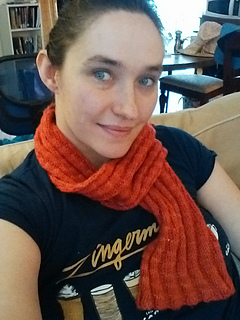 I made this one from Malabrigo Merino Worsted, so it is incredibly soft. I didn’t block it because I liked the squishy feel of it as it was, but if you wanted to block it to open up the width, you certainly could. 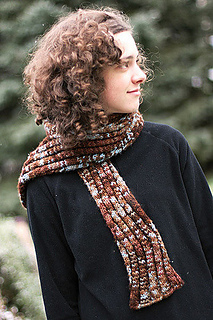 The sample scarf was made with approximately 150 yards of Malabrigo Merino Worsted, but you could choose to use the whole skein for a longer scarf. 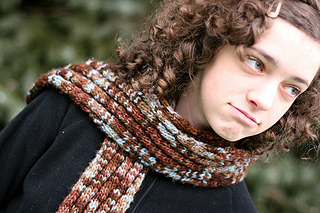 Errata: Please note that there was an error in Row 8 of the pattern. It has now been fixed to read, “Row 8: Repeat row 6.” If you printed the pattern out prior to 1/2/09, please make note of the change. I apologize for any inconvenience!